After diving on the Bahamas I wanted to see the famous keys as well. 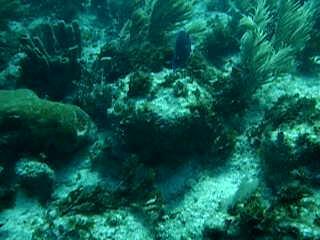 I went on a dive trip to Key Largo warned of "high sea". Unfortunately the two chosen dive spots were rather shallow, none deeper then 12m, the second one most of the time less then 7m. That made the surf not just noticable but quite annoying even close to the bottom and the fine sand was getting into the water ruining visibility. I still got some nice photos from there, as the fish seemed to let me a little bit closer.